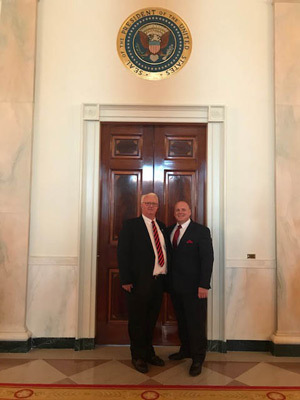 On Monday at the White House, Rep. Jerry Knowles (R-Berks/Carbon/Schuylkill) and I were honored to attend President Donald J. Trump’s Salute to the Heroes of U.S. Immigration and Customs Enforcement (ICE) and U.S. Customs and Border Protection (CBP). The event was held to recognize the dangerous, important work of America’s border officers. ICE and customs officers risk their lives protecting our borders every day and we owe them a debt of gratitude. Yesterday, we were in a room full of federal law enforcement officials and families of fallen officers, including those who have saved countless lives on the border and beyond. It was humbling to see the president honor these fallen ICE agents, who in addition to keeping us safe, were also family members, friends and neighbors. I am proud to stand with the president in defense of ICE and customs officers who graciously serve our nation and its people. Moving forward, I would like to see local, state and federal officials working together to combat issues like human and illegal drug trafficking, illegal immigration and more. The 2018 Senior Citizens Expo I’m co-hosting with Sen. John Yudichak is two weeks away! The annual expo will be held on Thursday, Sept. 6, from 10 a.m. to 1 p.m. at the Franklin Township Volunteer Fire Company, 2440 Fairyland Road. Though this is a new location, the attendees can expect to receive the same great information as in years past. More than 50 vendors and state agencies will be on hand to provide information. Lunch will also be provided. You have likely found my latest newsletter in your mailboxes. In it, you’ll learn about the work I’m doing in Harrisburg and in the 122nd District. You can also read the newsletter online by clicking here. 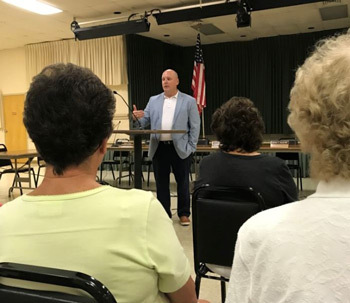 I recently spoke at the Jim Thorpe Community Watch meeting. 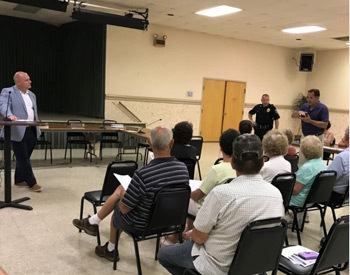 Thank you to Mayor Michael Sofranko, Chief Joe Schatz and all the community watch members for all you do to keep Jim Thorpe safe. If you would like to continue receiving my legislative updates from now through the November election, click here and simply enter your email. This will guarantee that you continue to receive my weekly updates.